Joe Norris started to paint at 49 years of age when a severe heart attack forced him into early retirement in 1972. This renowned Nova Scotia folk artist was born in Halifax but moved with his family to the small hamlet of Lower Prospect, Nova Scotia when he was seven years old. Joe did not attend school regularly; partly because of pleurisy from which he suffered throughout his life, and partly because he actively sought work in fishing boats to supplement the family income. In 1975 he was discovered by Art Dealer Chris Huntington. During the previous three years he had painted in his kitchen window and would prop up his paintings on the side of his little yellow house in Lower Prospect and sell them for a few dollars. Encouraged by the attention his work was receiving he moved beyond his house to paint the honest simplicity of rural life in Nova Scotia. 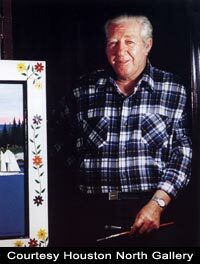 Joe also painted furniture, chests, and tables and his paintings and furniture is found in the collections at The Canadian Museum of Civilization and the Art Gallery of Nova Scotia. Like Maud Lewis, Joe Norris is now a National Treasure and Nova Scotia Folk Art Icon. His pink skies continue to delight collectors the world over. Photograph by Houston North Gallery, from the book "Joe Norris Painted Visions of Nova Scotia" by Bernard Riordon, from Goose Lane Editions and Art Gallery of Nova Scotia.